It’s always nice to have off one weekday. Sure, it stinks working on Saturdays, when the rest of the world is off, and it’s 75 degrees and sunny, but in the restaurant world, everyone knows that working on Saturdays is inevitable. And besides, being off Monday, when the rest of the world is dreading the beginning of week... it’s got its perks. Perks, such as lunch with Cynthia and Stehle. Now, of course, I can’t decide what to order. I always want everything. As soon as I looked at the menu, I knew I wanted the Fried Green Tomatoes with lemon buerre-blanc and lump crabmeat. From there, it was either Tuna Tacos served with mango-papaya salsa, black beans and corn tortillas, or the Twisted Turkey with bacon, Vermont white cheddar, and honey-Dijon served on a pretzel roll. I chose (hind sight is 20/20) the Twisted Turkey sandwich-- the pretzel roll definitely sold me. We ended up getting the Seared Ahi Tuna appetizer as well, so I could taste some tuna. Stehle ended up with the Mediterranean Shrimp Wrap with house dressing, which looked like a remoulade, served in an Old Bay tortilla. Cynthia ordered the Poached Salmon Salad, but got the salmon grilled instead. And, showing her support for the bartender, another Bloody Mary for Stehle. When the appetizers arrived, I knew we made good decisions. I could smell the buerre-blanc coming off of the fried tomatoes before he put the plate on the table. When I cut into the tomatoes, I could tell they were going to be good. Perfectly al dente! The lemon butter and the crab together made a perfection combination, and it was garnished with fresh chives. The seared Ahi tuna appetizer was perfect as well. Served rare, alongside a bed of pickled vegetables, the tuna was finished with a drizzle of cucumber-wasabi sauce. The appetizers were definitely the highlight of the whole meal. It took a long while to get the entrees, considering what we ordered, however, I understand that sometimes it is hard to get the timing correct when tables get more than one course, so I’ll let that slide. My pretzel roll that was psyched for, was disappointing. I wanted a crispy, grilled pretzel roll with cracked sea salt, however, mine just tasted like a buttered potato roll. The turkey sandwich was not awful, and if you’re in the mood for a great deli sandwich, sure, opt for that. (Tell them to toast the roll!) I just felt as though I could have gotten a turkey sandwich anywhere, and I made a poor choice. Stehle’s wrap looked good - the shrimp were huge, and perfectly cooked, but the house sauce inside could have been more flavorful. Cynthia’s salad was good, too-- a bed of field greens and asparagus topped with a generous piece of salmon. It said it was supposed to be served with a red wine vinaigrette, but it had more of a lemon flavor, which was fine with me, because it was a great dressing. We all did not care for the “green goddess aioli”, but it comes on the side, so no biggie! All-in-all, I thought Bluestone was a good lunch spot. I mentioned to the girls that next time, I would get two orders of the tomatoes and call it a day, they were so good. I would visit again and again, until I found all of the gems on the menu, because I feel like they have some good ones, and I feel like we could have made some better entree options. One of the best parts was the atmosphere. Very modern, very roomy, and lots of natural light, which I love... I hate being squished in the corner of a dark restaurant! 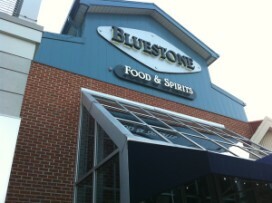 The service was great, and I definitely want to go back to Bluestone to try their dinner menu options!